Proper air conditioner maintenance or heat pump system will ensure that the equipment continues to provide the cooling or heating needed especially during summer or winter. Some of the steps that you can take are simple and do not require a service technician to do them. Equipping yourself with these simple technical knowledge will save you time and money in the long run. 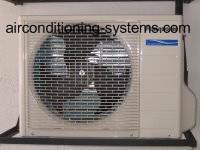 In a typical air conditioner, the condensing unit is usually located outside your house where the compressor, fan and the condensing coils are located. When cooling your house, this unit rejects heat to the surrounding by blowing the fan over the condensing coils. Make sure that there are no obstruction to the fan and air flow of the condenser. cleaning to ensure efficiency of air conditioner unit. Usually, you will find dried leaves, plastic bags and other unwanted materials stuck to the condenser especially if you have not been using it for a long time. If necessary, use a brush to remove them from the coils and ensure that the air can blow unobstructed from the condenser. You do not have to cover up the unit when not in used as these units are robust enough to stand the harsh outside temperature of the house. Just ensure that the unit that you purchase conforms to the safety standards such as UL or CE Mark. Remember to disconnect the power supply to the unit before cleaning the condenser. Remember, if you don't want to tackle your own maintenance, there are various contractors who will handle it for you but it will be more costly. Most indoor evaporator unit is fitted with removeable filters that trapped dust to prevent dirt from clogging the coils of the evaporator. These filters are easily removed and wash with water/soap to get rid of the dust. Do it at least once a month. Some units also come with electrostatic filters that act as a secondary filter system for the evaporator. Change them if they are dirty. If the coils of the indoor evaporator are dirty, use a vacuum cleaner or a wet cloth to clean them. Keeping the evaporator clean will ensure that the cooling capacity of the air conditioner is not lost due to the dirt that obstruct the flow of air to the room. If you are using a central air conditioning system, check the ductwork to ensure that the ducts are airtight by sealing loose or cracked joints using sealant. This will help to ensure the efficiency of the air conditioner. Clean and replace the filter if necessary. Ensure that the vents are not blocked by furniture in the house. If your unit has a remote control, make sure that it is working by checking the display and using it to control the unit. If you are not using the controller for a long period, remove the batteries. Learning the functions of the electronic control will ensure that you are able to operate the air conditioner effectively. Note that there are a few operating modes i.e. cooling, heating, fan or auto mode depending on the system that you purchased. Use of timer and other energy saving modes are recommended to save energy. It is always a good idea to power up the unit and run the air conditioner at the end of Spring to ensure that it is still in working condition. Make sure that you are operating the right mode and temperature to get the desired cooling or heating effect. See the first part of central air conditioning trouble shooting guide. See the second part of central air conditioning trouble shooting guide. Find out the possible causes why your equipment freezes up during operation. Use air conditioning coil cleaner to clean your evaporator or condenser.. Here are some basic safety precaution to take before handling any electrical equipment. Questions and answers on the faults and solutions to heat pumps system. A listing of tools that you will need to service or repair your HVAC equipments. Thermometers and pressure gauges are the commonly used instruments in servicing, maintenance and testing of air conditioning system. There are many possibilities why a circuit breaker trips. Here are some of the common causes of a tripped earth leakage circuit breaker and miniature circuit breaker. Vacuum pump is a basic tool that you will need to have when servicing the air conditioning system.